Special Offer : 10 % Discount before May for minimum 4 people. Ujjayanta Palace , Sepahijala wildlife sanctuary, Neermahal, Bhubaneshwari temple, Tripureshwari temple, Dumboor Lake, Chabimura Rock Mural, Unokoti Hills, Jampui Hills. Greeting at Agartala Airport. We expect you to catch the early morning flight and reach Agartala by 10:00 AM. Upon Check-in, we will drive straight to Baramura Eco Park (45 Kms) where you will get a feel of the dense forest of Tripura. After Eco Park we will drive down to “Fourteen God Temple”. The deity of Tripuri people. Offering our prayers to the Fourteen Gods we will break for Lunch near Ujjayanta Palace, our next destination. Ujjayanta Palace is the pride of Tripura. This is the only Palace in North eastern India of this Magnificence. Enjoy your walk by the Mughal style garden surrounded by two large water bodies. 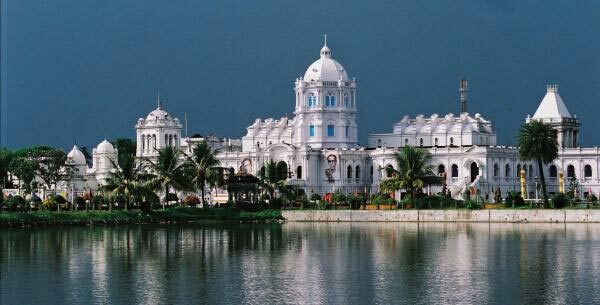 This palace is also our Tripura State Museum, where you can get a glimpse of the complete state from history to the future of development of Tripura. We bet, you cannot not resist yourself from taking photos and capturing selfie’s in this royal romantic garden. Our next spot is Akhaura Check post where you witness the colorful Flag exchange ceremony between India and Bangladesh Boarder Security Personals. Finally, let us recharge for the next day. Day 2 starts with a one hour journey to Shepahijala Wildlife Sanctuary. It houses the only zoo in India which is inside a sanctuary. Spread across an area of 18.5 km, the Shephaijala is home to the rare Hoolock Gibbon as well as hundreds of species of residential and migratory birds. There’s a lot you can do here - visit the zoo and the botanical gardens, as well as enjoy elephant rides and boating too! After Spending some time with the animals, we will drive towards Neermahal, the grand and impressive ‘Lake Palace of Tripura’. We will have our lunch at Guest House by the lake. the Neer-Mahal (Water Palace / Palace on Water) is the ‘only lake palace’ in all of India’s northeast. The major attractions of this heritage palace are its Open-Air-Theatre, the Andar Mahal, the sound and light show, and the glorious combination of Hindu and Muslim architecture. After enjoying the boat ride, we will start for Udaipur, the temple town of Tripura, to offer our prayer to l Goddess, Tripura Sundari early in the morning. Stay in Udaipur. Tripureshwari temple has a pond inside its boundary which is famous for the soft shelled turtles, a unique species which is not found anywhere in the world. You can also witness the conservation efforts given by environmentalist to keep the few members alive in this world saving them from extinction. After Offering puja, we will head towards Dumboor Lake. The lake is spread across an area of 41 sq km. 120 km from Agartala, the Dumboor Lake is named after Lord Shiva’s Dumroo owing to its tabour or a small drum-like shape. The blue serene lake water looks brilliant against the backdrop of the lush greenery all around. Many species of migratory birds visit the lake, and the 48 islands here make the Dumoor Lake a beauty beyond compare. After a tiring day, night halt at Udaipur. and Mahamuni Pagoda. We can also visit some local spots like Bhubaneshwari temple and other local temples of the temple town. After a day’s visit, we will get back to Agartala, to prepare ourselves for North Tripura tour. CHABIMURA ROCK MURALS - On the banks of the Gomati River, around 7 km from the town of Amarpur, you can spot some of the most superb rock carved murals of Hindu Gods and Goddesses such as Lord Shiva, Vishnu, Kartika and Devi Durga. Dating back to 15th - 16th century, the Debtamura or the Chabimura Rock Murals adorn a steep mountain wall and add to the region’s mystic beauty. Undoubtedly, your visit to Tripura will be incomplete without a visit here. Additional one day is required to visit this place. UNAKOTI - About 178 km from Agartala lays Unakoti, a ‘Shaiba’ (Saivite) pilgrimage site that can be dated back to the 7th – 9th century. 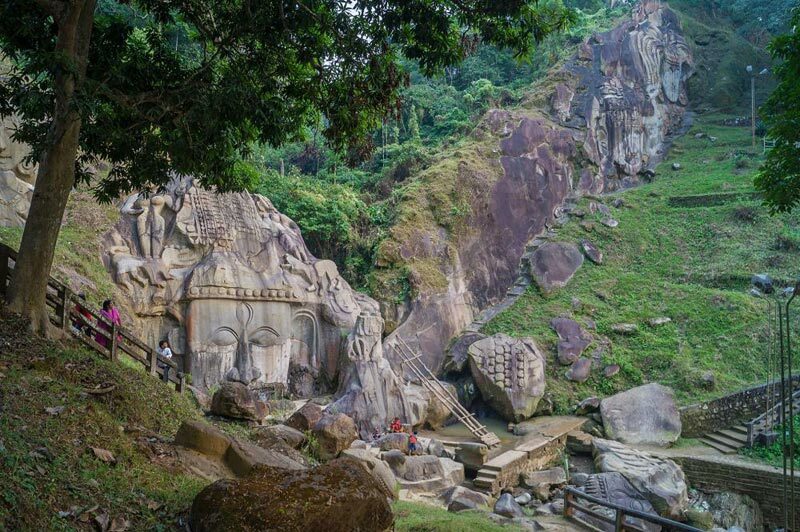 Home to awe-inspiring stone images, waterfalls and beautiful rock-carved figures of Gods and Goddesses, Unakoti is a popular tourist destination and a major contributor towards Archaeological Tourism in Tripura. The large central Shiva head and Ganesha figures are the highlights of the beautiful rock-cut carvings found here. Stay at Dharmanagar. district of Tripura. The average altitude of the hill range is approximately 1000 metres above sea level. It is famous for Orange cultivation and picturesque valleys. You may get lucky to meet the clouds. These days coffee is also grown in the valleys. Enjoy the mountain and sleep with them at Eden Tourist Lodge. Come back to Agartala and take rest. Go for shopping at Purbasha, Govt of Tripura’s Handloom and Handicraft outlet which is a perfect showcase of local products. Best place to buy authentic souvenir from this Royal state of North East India till your next visit.